HowTheMarketWorks is all about education – we want students to learn about investing and personal finance by managing their virtual portfolio with carefully-selected trades. Every time your students place a trade, they will be prompted to enter their “Trade Notes” – a short sentence mentioning why they are placing this trade (almost like a tweet, but we allow up to 300 characters). Students can review their Trade Notes later from their Transaction History and Order History page. They can also add a note to any trade at a later time to explain if it was a good investment, or if they took a big loss. Most teachers already include a writing project for students to show how their portfolio moves over time – the only drawback is that students can always look back at their portfolio with 20/20 hindsight. To make sure students can always review their critical thinking skills, teachers have two powerful new tools with trade notes. First, you can make the notes optional or required for your class. If you require trade notes, students will need to enter a note every time they trade. 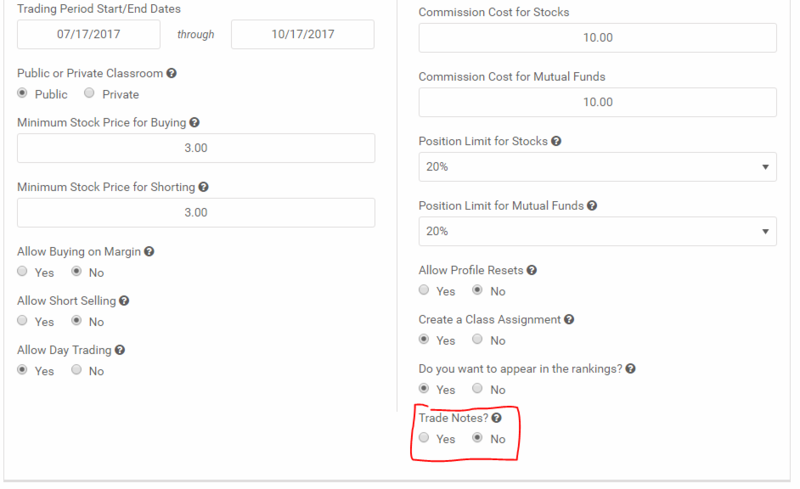 If it is optional, students can enter trade notes as often as they want. To protect students from themselves, trade notes cannot be deleted. This means they cannot realize a mistake and change their reasoning later! 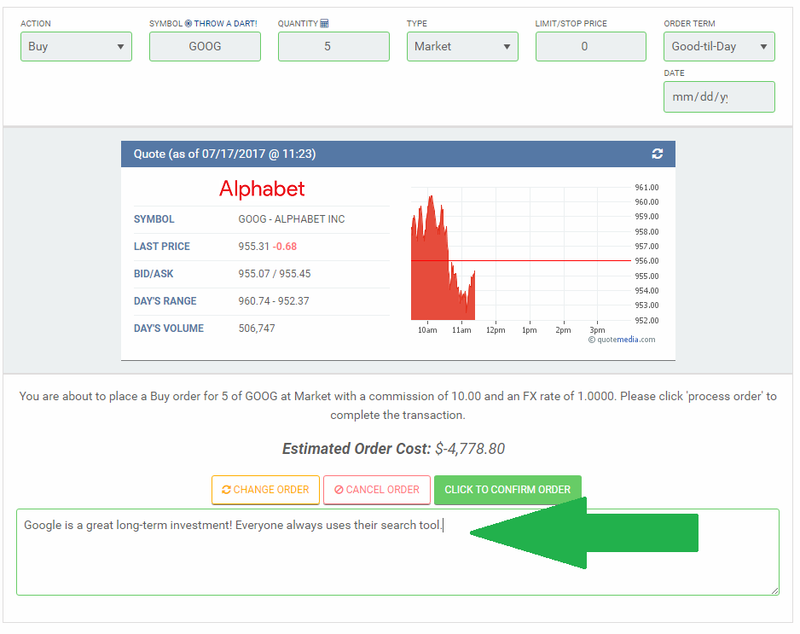 Students can always add extra notes to the same trade, but as the teacher you will have a time stamp showing when the trade was placed, and when each note is added. Trade Notes are optional on all classes, so your students can start taking notes right away! If you want to make Trade Notes required, create your new contest, or edit your existing contest, and set the “Trade Notes” rule to “Yes”. You can also see the trade notes for every student in your class. Just visit your class Rankings page and click “View” next to the student you want to review. This will show you everything about that students’ portfolio – including their trade notes!